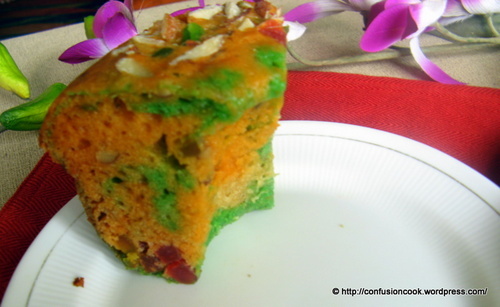 Tri-color Eggless Tutti-Fruity Cake – Chocolate Rasoi – Part 5 & Celebrating 64 years of Independence – Jai Hind! Time for some patriotism. Sadly so, patriotism is celebrated & remembered only once a year, rest of the year we are discussing who is better – Hindu/ Jain/ Muslim/ etc etc. I’m also one of them who remembers it only once a year but I am still very proud of being an Indian. Due to 15th August, we have got extended weekend and like others we also made plans of going to Mumbai to visit my aunt. BUT, the real deal was to get my very own – ramekins, 9″ springform pan & silicone muffin cups, which she has so kindly brought for me from US. 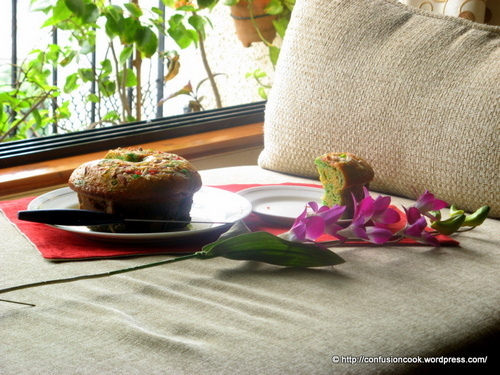 :-) Since, I didn’t want to visit her empty handed and from the time of my home-baking days, I crib on buying sweets from outside, I decided to bake her a Tutti-Fruity Cake in tri-color and celebrate the occasion with her. 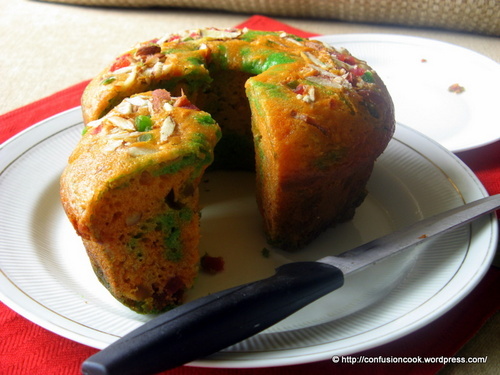 The recipe is of Cherry Marble Cake from Chocolate Rasoi Workshop I attended in May this year. Anjli introduced me to a contraption known as Electric Oven, which is easily movable, can be set up anywhere, has temp regulator but no timer. I’ve used a bundt pan for the cake, replaced yellow & chocolate color with orange & green. Pre-heat the oven at 180 C. Grease & dust a bundt pan. 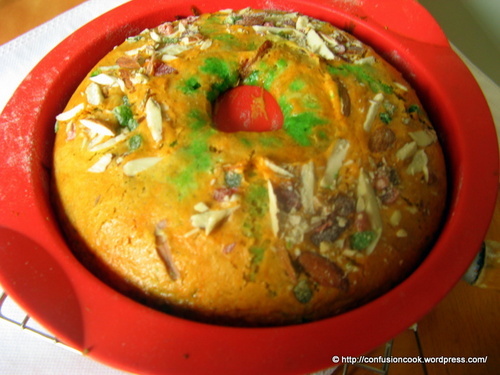 Slightly warm tutti-fruity & almonds and then coat lightly with flour. 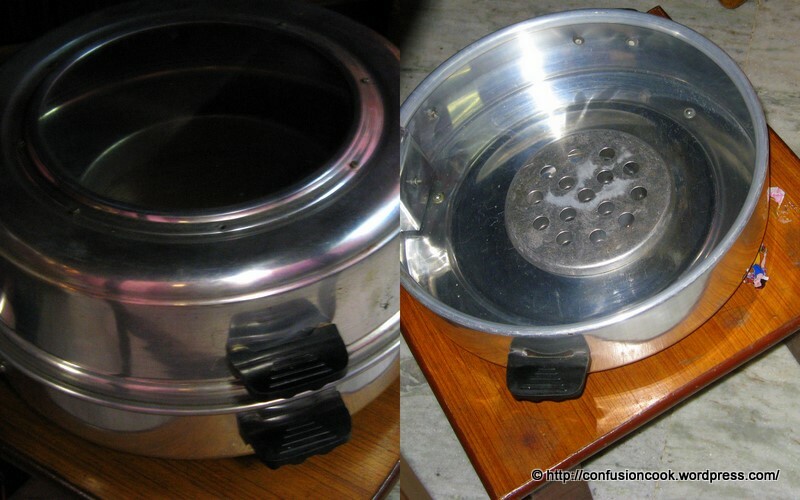 Sieve together flour, baking powder, baking soda & corn flour together. In a large bowl, mix together condensed milk, sugar & essence lightly for 1 min. While the hand mixer is running slowly add oil and mix it well. Add half the dry ingredients & milk and beat well for 2-3 mins. Add remaining dry ingredients & milk and beat well. Scrape down the sides & mix well till uniform. 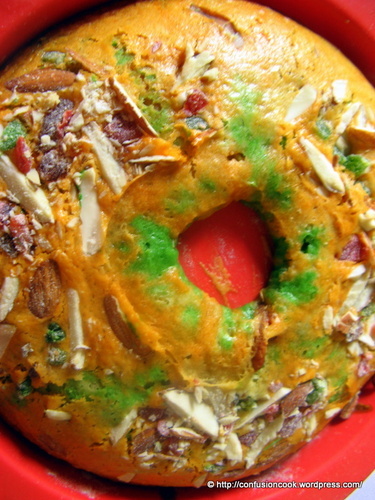 Slowly mix in half of fruits & nuts in the batter. Don’t over mix it. Divide the mixture into 3 parts – to one part add orange color & to the other part add green color. To make a flag – first pour green colored batter in the pan, lightly tap it so the batter is settled, then pour white batter (to which you have added no color) and in the end pour orange batter. Sprinkle remaining nuts & fruits on top. Gently tap the pan. Bake in pre-heated oven for 40 mins. Cool in the pan for 10 mins on a wire rack. Gently de-mould & allow to cool completely. Slice & serve with cold ice-cream. Enjoy celebrating Independence Day while eating. 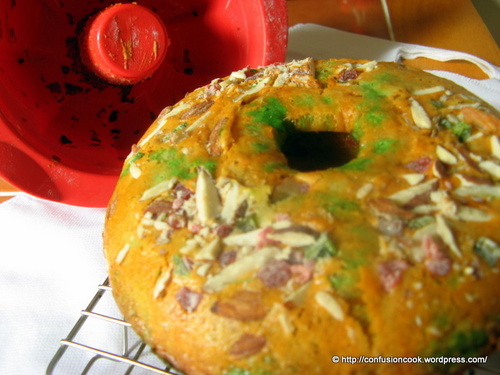 * Cornflour is added so that the colors do not over mix among themselves. The cake was loved by both my uncle & aunt & Mr. V (that goes without saying). Cake was rich, moist & soft. The colors didn’t form a very clearly demarcated layer as I had hoped they would. But who cares when it comes to taste. Happy Independence Day to all. Jai Hind! If the cake has already been baked for 10-15 mins in an oven and the power goes off, then it can be baked in gas tandoor or pressure cooker. While baking cake in an OTG, only use lower rod, and for final browning you can turn on upper rod for last 5 mins. The cake which is to frosted, should be made using oil instead of butter, otherwise the smell of butter overpowers the cream. For longer shelf life, make a cake with butter. Cake made with oil smell faster.